My first signs of the condition occurred in second grade when I began having difficulty seeing the chalkboard. Since these initial signs, my vision has decreased dramatically and current acuity is 20/500. Although my visual decline has been progressive, losses have been quick followed by periods of stabilization. The simplest way to explain my vision is blurriness and distortion. The condition I have is known as Stargardt’s disease. 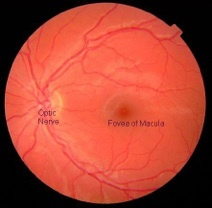 Stargardt is the most common form of inherited juvenile macular degeneration (MD). Stargardts disease is symptomatically similar to age-related macular degeneration, and it affects approximately one in 10,000 children. I inherited the condition as an autosomal recessive trait, with both my parents being carriers but not having the condition themselves. The condition is a severe form of MD usually diagnosed in individuals under the age of twenty. The cardinal sign of the condition is a progressive loss of central vision. My first signs of the condition occurred in second grade when I began having difficulty seeing the chalkboard. Since these initial signs, my vision has decreased dramatically and current acuity is 20/500. Although my visual decline has been progressive, losses have been quick followed by periods of stabilization. The simplest way to explain my vision is blurriness and distortion. My condition (Stargardt disease) is caused by the accumulation of lipofuscins (waste deposits) in the retinal pigment epithelium (RPE) layer beneath the macula. 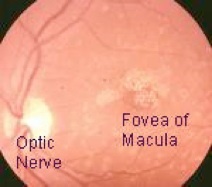 This "lipofuscin" appears as yellowish-tinted speckles around and over the macula. In the normal eye, the RPE serves to nourish the photoreceptor cells. In my eyes, these cells are unable to adequately breakdown Vitamin A resulting in a buildup of A2E (a toxic by-product of Vitamin A breakdown) and atrophy of the macula and RPE. Up until I was 15yrs old there was no explanation for the mechanism underlying the condition. In 1997, the gene responsible for my condition was discovered. Researchers found that if the ABCA4 gene is defective, transport cannot take place, and the waste remains in the photoreceptor tissue, where the toxic A2E poisons the healthy cells. Currently, there is no effective treatment for Stargardt disease, but having the genetic makeup of the condition will assist in developing new strategies for therapy. Exposure to light has been correlated with an increased accumulation of the toxic A2E by-product. In studies with mice, researchers have observed that mice which had a mutation of the ABCA4 gene, and which were reared in dark environments had virtually no lipofuscin deposits. This gives added importance to use UV protection sunglasses during high light exposure periods. Despite this condition, I have found ways to stay independent. Many times people have no idea I have this condition. The reason for this is that we underestimate the power of our other senses. In fact, if vision is based solely on mobility and independence than I am only minimally impaired. My vision is a direct result of constant observation, sound recognition, relating life experiences, memorizing large landmarks and asking descriptive questions. Although I am supposed to use a cane and definitely qualify for the services of a seeing eye dog, I would rather not use them until I feel as though they are necessary for my safety. I do however use a sighted guide when I compete.